It seems that our days have been filled with work ... some for pay, some not. Weekend ... what's that?! With the hope of avoiding the costs of a property manager when we leave, we've been working on getting our rentals in the best shape possible. In addition to the rentals and our regular jobs, we've also been working on our daughter's house. It's moving along ... the house is framed, the roof is on, and if the weather permits ... Ken will be adding the Hardie-plank siding next week. Then, it's full steam ahead inside! Although our schedules are busy, we make time every week for our Sunday visitation with Nirvana. 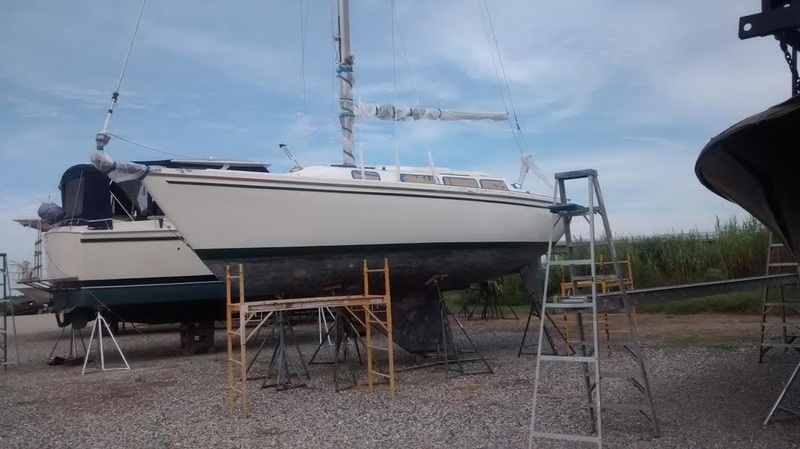 The boatyard is about 15 minutes away, and we take the ride every Sunday morning just to take a look at her. It's always a relief to see Nirvana as we come over the bridge ... still standing! We anxiously climb inside, remove the companionway doors, and look to see if she's still dry inside. The weather has been really crappy lately. It's either been cold, rainy or thick with fog. The air is full of moisture, but luckily Nirvana is always dry inside. So far the silicone is still keeping the holes in the deck from leaking .. whew! Also, it seems that a fair amount of sailboats suffer from condensation, but not our Catalina ... should I knock on wood? Each week that we're away from her, we get nervous about what may be going on. But, every Sunday we're back to feeling good ... she seems to be a solid boat. We assure Nirvana that we'll be back soon, and that we'll be spending some time with her just as soon as the weather warms up for more than a day or two. Time has changed and hopefully the longer days and warmer weather will allow your visits to become more frequent! If we can just get past the rain....hope to see you guys out on the lake soon!